All the phone numbers are given in the personnel pages. The observatory is located some 12 kilometres from Turku towards Helsinki between the city of Kaarina and the municipality of Piikkiö. Please, see a map in the web. The main road passing the observatory is road number 110. The junction off this road is marked with a sign with names Varsinais-Suomen maaseutuoppilaitos, Tuorlan observatorio, and Tuorlantie on it (see the photo on the right). 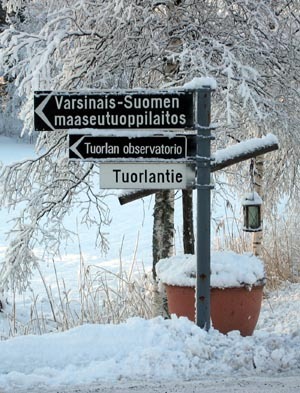 Continue about 50 metres on a birch tree alley and turn left (there is a sign pointing to Tuorla Observatory). This road takes you past a couple of buildings and enters the woods, ascends to a hill, passes a couple of domes and finally arrives to the main buildings of the observatory, about 400 metres from the turning. The busses number 700 and 702 leaving from Turku marketplace stop at Tuorla. These busses belong to "Föli"-ticket system and are the cheapest. See more detailed information from the Föli-website (insert From: Kauppatori, To: Kaarina,Tuorlan maaseutuoppilaitos). Also some busses leaving from the main bus station stop at Tuorla. They all take passengers from the cathedral bus stop, or any other stop along Uudenmaankatu. Ask for a ticket to Tuorla. It will cost you a few euros and takes 20-30 minutes. If uncertain where to stop the bus, watch directly ahead and when you see the tall tower dome of Tuorla 1 metre telescope, move to the driver and remind him to stop at the Tuorla bus stop. Do not press the stopping signal when you see the tower, because then you are dropped off one bus stop too early. The Tuorla bus stop is next to the abovementioned junction and the street signs in the photo on the right. 1) Coming from Turku, using the motorway: Drive some 10 kilometres and look for a junction marked with number 7. Depart the motorway there, turn right and drive about a kilometre to road number 110. Turn right and drive another kilometre until, in a middle of a long strip of straight road, you find the junction off the road and see the street signs in the photo on the right. 2) Coming from Turku, using the road number 110: Drive some 10 kilometres, you will see the tall tower dome of Tuorla 1 metre telescope on a forest hill about a kilometre before you should turn off at the junction with the street signs in the photo on the right. 3) Coming from Helsinki: Some 15 kilometres before Turku begin to look for a junction marked with number 7. Depart the motorway there, turn left and drive about a kilometre to road number 110. Turn right and drive another kilometre until, in a middle of a long strip of straight road, you find the junction off the road and see the street signs in the photo on the right. Parking: There is plenty of parking space at the observatory. If you like, you may also visit Hostel Tuorla and walk the 400 metres from there.